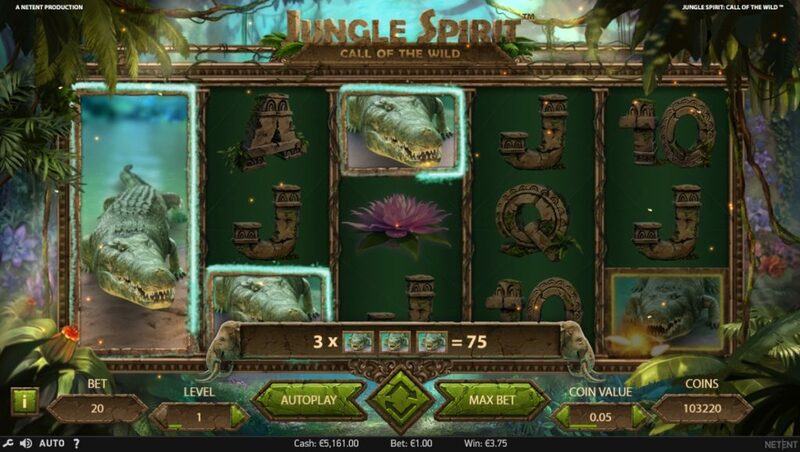 “Roooaarrr” – there will be a big rumble in the jungle on 21st March 2017 when Jungle Spirit: Call of the Wild™, the new Netent creation is released into the online casino world. Ever been on a African safari and remember all the sounds and noises? 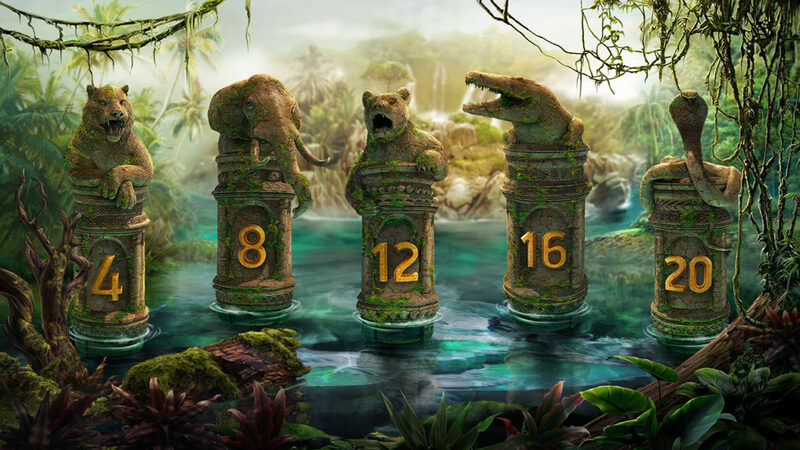 Prepare to embark on a mysterious journey as this slot will take you back exactly to that experience and keep you well entertained with 243-ways to win, expanding to 1,024-ways in Free Spins with mega and super mega win potential. In pure numbers, maximum 1822.5 x stake in the base game and 7,678 x stake in the Free Spins. That is clear DoA territory but it remains to be seen if this slot has what it takes. On first inspection the slot is visually very appealing with extremely sharp graphics, seamless 3D animations of the jungle beasts when they complete a winning combination, magical butterflies that act as a win booster, intricate water lilies as scatters, all combined with a jungle background where wild nature comes to life, ready to jump out of the screen. Players can even choose their preferred sound animation with either intense drums and screams of wild animals or calm nature sounds. 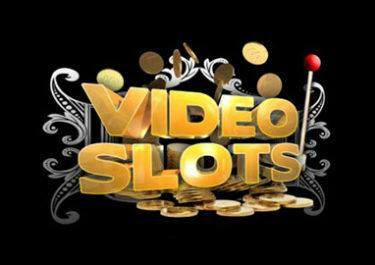 To add to the excitement Netent included a range of features that will increase win combinations such as expanding symbols and a random butterfly win booster. The loudest music though, speak biggest win potential will be in the Free Spin bonus rounds with five options available to the player. 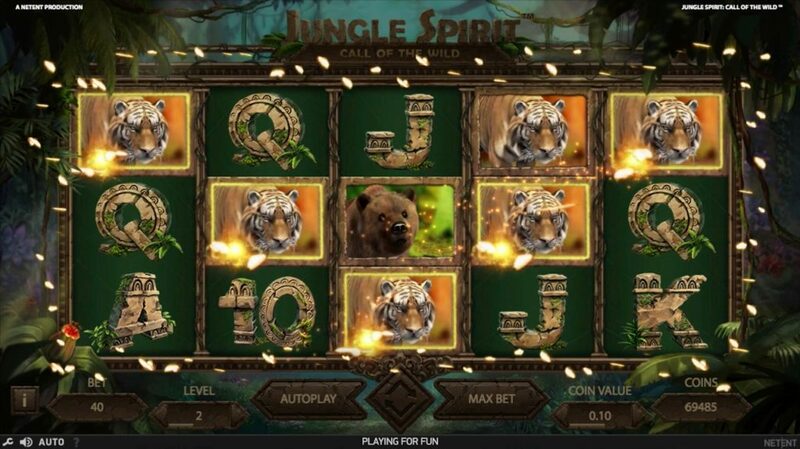 Jungle Spirit: Call of the Wild™ is a 243-way video slot in 5×3 format, expanding to 5×4 with 1,024-ways in Free Spins. It will be released in HTML5 format for play on desktop, mobile and tablet. Bet sizes can be adjusted from $0.20 to $100 with coin denominations ranging from 0.01 – 1.00 and bet levels 1 – 5. TRTP is a generous 96.47% which in combination with the rather low line pays is making it a medium variance game that should give ample entertainment and regular medium to big wins. Low paying symbols are the traditional 10 – A set, while medium paying symbols are cobra, crocodile, bear, elephant and tiger in ascending order. The top symbol only pays 7.5 x stake on a single line but in combination with expanding reels or the 1,024-ways in Free Spins can lead to some staggering winnings of up to 7,678 x stake. No Wild symbols on this slot but scatters in the form of water flowers that open up when they land on the screen. The most impressive animation is though the expanding animal symbols that seem to jump out of the screen when they complete a winning combo. Watch out! Each symbol in the game, except for the Scatter symbol, may be marked by butterflies as shown in the bottom right corner in the image above. The marked symbol will expand if it is part of a winning combination and cover the whole reel, basically tripling the win as the crocodile on Reel 1 in the image. A small window will pop-up to show the total winnings from the spin. The Butterfly Boost feature is activated randomly in the main game during a win situation, when there are no Scatter symbols or symbols marked by butterflies on the reels. The butterflies fly around the reels and will expand 1 to 3 symbols that take part in a guaranteed winning combination. The expanded symbol will cover the entire reel and can lead to a maximum 27 winning pay lines. Here plays the music! 3 to 5 scatters anywhere on the reels will trigger the Free Spin feature. No coin win for 2 or 3, but 4 or 5 scatters are awarded with an additional 15 or 50x bet. 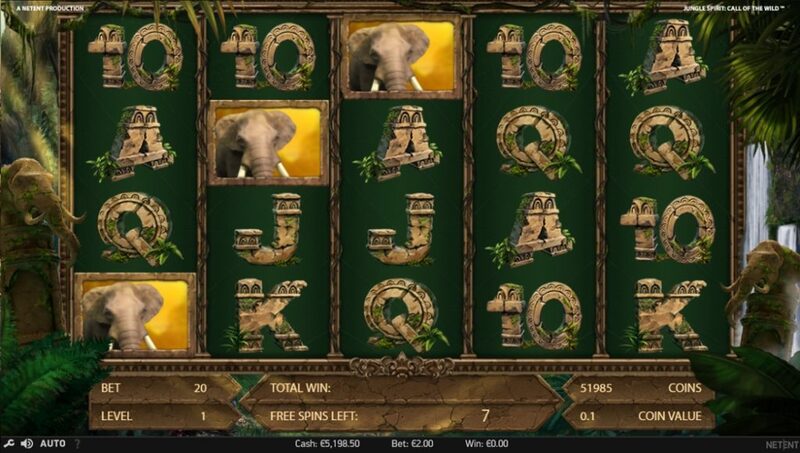 The games leads to a second screen showing five options with 4 – 20 Free Spins. The animal chosen will be the only medium symbol on the reels during the Free Spins with Tiger as the top symbol only awarding 4 spins but providing at the same time the highest volatility and win potential. The Cobra will have 20 spins but also the lowest win potential. Additional Free Spins cannot be won during Free Spins. Once the choice is made the game returns to the main screen and the reels expand to 5 reels with 4 rows and 1,024 pay lines. 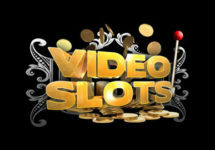 This is the moment where the maximum payout for this slot can be won. If the player has chosen 4 Tiger Spins then 5OAK expanding Tigers will award 7.678 x bet or in pure numbers a staggering $767,800 for the maximum $100 stake for the slot. Will Jungle Spirit: Call of the Wild™ be able to hold the candle to the epic Dead or Alive? Hmmm, to be honest in my view it could although it remains to be seen how easy it is to hit five Tigers marked with a butterfly in Free Spins. Probably not more often than a Wild Line on DoA but certainly just as profitable. Even the Cobra, the lowest medium symbols would produce a 3,000x bet win with a full 1,024-ways screen. The graphics, animations and sounds are just outstanding, the 3D effects are well designed and provide that “aha” effect when they happen. 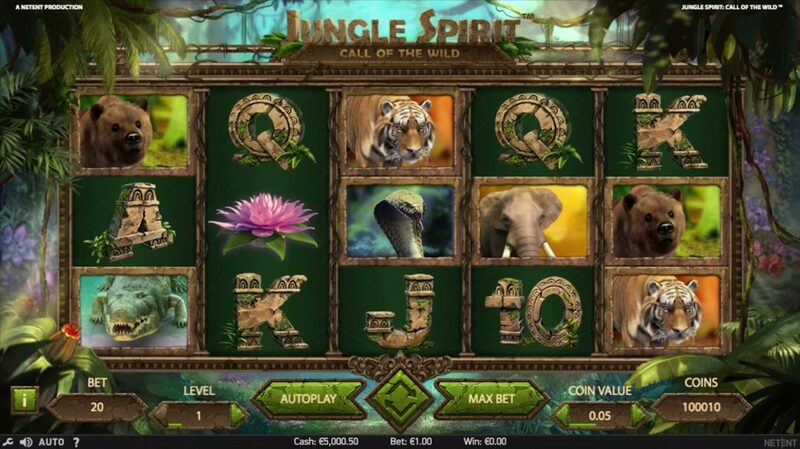 Overall, it is a very entertaining game with good win potential, hence, I will put this slot in the “must try” category when it will be released on 21st March 2017 and will give it a proper bash to see if the “roaaarrrs” of the jungle will be lucky ones.